Visaginas is an interesting and unusual soviet town in north-eastern corner of Lithuania. It's built and famous for one thing - Ignalina nuclear power plant, which Lithuania had to shut down in 2009, due to agreement with EU. Ignalina NPP was considered dangerous because it had the same type of reactors as Chernobyl did. The plans about new, modern station in the same place have not realized. So, how the power plant and the town looks today? I visited them in June 2017 and this post is about it. Ignalina nuclear power plant is closed for 8 years - but the place is not abandoned. The proof for that is not only the buzzing sound coming from the huge hangar-like building like a phantom of the times when electricity was still produced here but also quite many cars which are parked on the square next to one of nearby administrative buildings. At the same time, no living soul is visible around and there comes a feeling that power lines in the distance will start to crumble down at every moment, when Stephen King's Langoliers arrives in order to wipe this remnant of Soviet industrial power out of the earth. I approach the awe-inspiring place slowly, cautiously - have been lazy to search for any info before and so I even don't know is it allowed to be here without permit, let alone take out the professional photo camera and shoot photos. At least in Latvia, after the latest law changes, it seems that a man with a photo camera next to major infrastructure object is regarded as a clear sign of a terrorist. Comforting myself with a thought that no security personnel, surveillance cameras or photography prohibition signs are visible, I take some photos from available angles. They have to be found by driving in a few roads leading closer to power plant to get behind the trees. When got to some railway crossing where more detailed view of the building appeared, I noticed the first photography prohibition sign. Had no motivation to ignore it - NPP is just a grey, monotonus concrete monster made a bit more interesting only by both tripartite chimneys. Ignalina hasn't the usual thick cooling chimneys of nuclear power plants. It's nuclear reactors were cooled in the nearby lake, the largest in Lithuania - Drūkšiai. On the shores of the lake itself there are no signs that it has assisted in so potentially dangerous process - on the other side, at Tilže village, water is clear, fishermans fishing... However, as Wikipedia informs, the power plant has circulated the lake water in huge scale - nine volumes of lake in a year - and it has polluted the lake both thermally (by heating up the water) and fostering eutrophication, both with chemical substances. Interesting atmosphere prevails also in former NPP workers town of Visaginas, 7 km away from the plant (it has to be noted that Ignalina NPP isn't located at Ignalina town which is some 40 km to south-west). Visaginas, settled in the area of pine forest, is the newest town in Lithuania, built in the seventies alongside the power plant. Similarly as the citadel of Pļaviņas hydro electric power plant in Latvia, which initially was called "Stučka", also Visaginas at first got a name after a local Soviet official and was called "Sņečkus". Soviet planners and builders have tried to implement Le Corbusier's ideals here more seriously than in which each town - wide avenues, spacious pavements with planted rose bushes on sides, more interesting apartment buildings built from bricks (alongside the usual commieblocks), etc. It all gives some feeling of a more quality apartment areas of Western Europe. Of course, only if time had not done it's part - the pavements are bumped by the roots of trees, handrails of balconies rusted, etc. The only evidence of modern development (apart from omnipresent contemporary cobblestone and some shopping malls) is newly built Orthodox church. Why Orthodox? Of course, because more than half of Visaginas inhabitants are Russians, Lithuanians here are only 15%, Belorussians - 10%. Visaginas population from it's peak at the end of eighties when it reached 33 000, has been dropped to around 20 000. Despite this, it's too harsh to call the place an upcoming "ghost town" as Russian propaganda media Sputnik recently did. Of course, the town is calm and silent, but also lively enough, and feels pretty safe - I didn't counter drunkards, aggressive or otherwise "shady" people there. I have no idea what Visaginas inhabitants does after the closing of nuclear power plant, how they earn their daily living, but at least for now there are no signs of overall decadence. 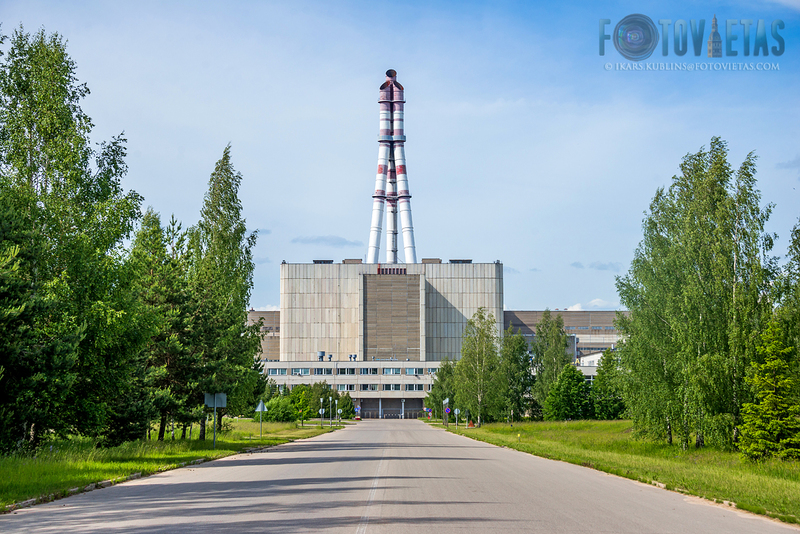 In overall, a visit to Ignalina NPP and Visaginas is an interesting, unusual experience. Of course, if one has a wish to see also something different from historical old towns or nature landscapes. Follow our Facebook page and be informed about the newest photos of Riga, Latvia and Europe, articles of interesting places, city planning and development in Photoriga.com!